The site of the RMIT Printing School was originally part of the two-acre Presbyterian Church reserve bounded by Curzon, Elm, Union and Queensberry Streets. The Denominational School Board donated a prefabricated iron building which was erect-ed in Elm Street in 1855 and opened as the North Melbourne Grammar School in 1856. To many of its pupils, however, it was known as "the old tin pot school" and letters to The Age in 1934 contain vivid recollections of the old school and its headmaster, John Marshall. It was removed in the 1890s. In 1877 the Education Department acquired the western part of the church reserve and architect Henry Bastow designed a two-storey Venetian Gothic school building to accommodate 640 pupils on Queensberry Street. Completed in 1882, this historic old school is now on the Victorian Heritage Register and is grad-ed A in the City of Melbourne's Heritage Places Inventory 2000. The Board of Works plan dated c1895 (shown below) shows the Elm Street frontage as open space. As you can see, there was quite a lot of open space in this part of North and West Melbourne at the turn of the 20th century. The Benevolent Asylum, on a large site opposite the school site, was demolished in 1911. Senator Barker's suggestion to turn the,10-acre site into a recreation reserve was strongly opposed by Errol Street businessmen who claimed that there was "any amount of breathing spaces in the shape of plantations and rockeries". Even the 1911 proposal by the Women's National Association for an enclosed children's playground on a portion of the asylum site was abandoned because the Melbourne City Council wanted to maximise the number of rate-paying properties. Today, houses, office buildings and the former Loco Hall cover its once extensive landscaped gardens. A pavilion was built at the rear of the school in 1922, which was used as a kindergarten, and local residents also remember a tennis court on the site. Apparently it was very popular with local kids on summer nights and weekends. The Melbourne Printing Trades School (later the Melbourne School of Printing and Graphic Arts) acquired the old Queensberry Street State School in 1950. A two-storey, cream brick veneer building was erected behind the school along the Elm Street frontage in 1956. The printing industry expanded rapidly and in 1965-6 three more floors were added to the Elm Street building to provide for additional accommodation and machinery. Although five storeys high on Elm Street and six storeys at the rear, it is approximately 24 metres in height, the equivalent of a modem eight-storey building. The Printing School later became part of RMIT and in 1999 relocated to a purpose-built centre in Brunswick. 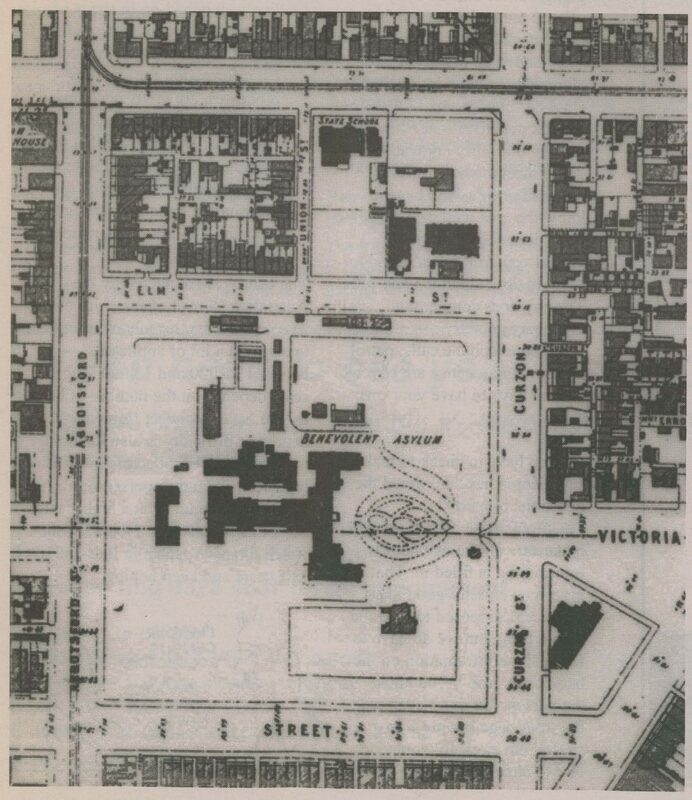 Plans for North Melbourne dating from the 1850s indicate the intention, later abandoned, to locate the town's public buildings in parkland running along the North Melbourne creek bed (now O'Shanassy and Harris Streets). A precinct comprising a community centre in the historic building, set within public gardens, a short distance from the Errol Street shopping centre, would bring some much needed greening back to the heart of North Melbourne and provide a wonderful facility for all the residents of North and West Melbourne. by Mary Kehoe - member of the Hotham History Project, September 2001.